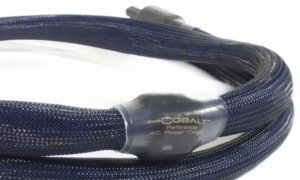 The Cobalt AC Reference Power Cable is a reference quality AC Power Cable having both High-Frequency conductors (Rectangular Solid Core) matched with specially adapted Low Frequency conductors. The Cobalt Reference AC has 18 high frequency conductors for the Live run, and 18 high frequency conductors for the Neutral run. The Ground path is comprised of shielding and 18 AWG solid core conductors that are fitted with Ceralex® capsules.